Birds are stripped every five weeks and their bleeding wounds are roughly sewn up with a needle and thread before they are slaughtered at 6 months old. The men and women from the brigades work without feeling, grabbing terrified geese by their wings or legs, sometimes breaking them, always hurting them, as they tear out the birds’ feathers. Down, the soft breast feathers of live birds, is mixed with slaughterhouse feathers from ducks and geese to fill pillows and coverlets at many hotels and in the making of some designer outerwear. The feathers originate on industrial farms where they are ripped from the bodies of live geese, leaving them bleeding in excruciating pain. Other feathers are byproducts of the foie gras industry, in which ducks and geese are force fed with metal tubes to create diseased livers for gourmet appetizers. Birds who are not plucked alive but whose feathers are included in pillows, comforters and clothing are confined in filthy, disease- ridden buildings the same as the live-plucked birds. 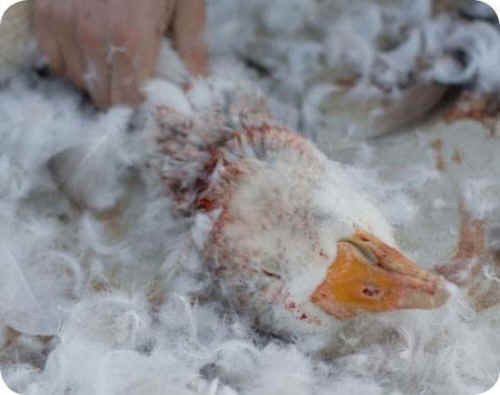 Feathers from slaughtered chickens are stuffed in pillows and coats along with feathers from more than 2 billion slaughterhouse ducks each year. When making hotel reservations, arrange in advance to have only polyester-filled pillows and coverlets in your room when you arrive. Explain that you want this guarantee the same as no smoking. When you get to the front desk on arrival, reiterate your request for feather- free pillows, and when you get to your room, examine the pillows! Remove the pillow slips until you get to the pillow and READ THE TAG. It will say if the pillow filler is down/feathers or polyester. If down/ feather pillows are in your room, call the front desk and ask that they be removed immediately and replaced with feather-free pillows. Inform the hotel that you are ALLERGIC TO ANIMAL ABUSE and that their “pillow policy” will influence your future hotel choices. 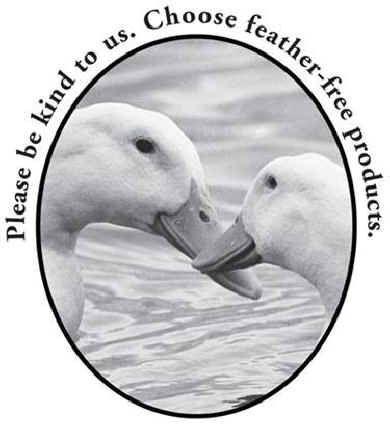 Educate your family and friends and look for opportunities to write letters to the editor and participate in media forums about the cruelty of down/feather products. No one who learns the truth will choose to wear a coat made of cruelty or to sleep on a pillow of pain.